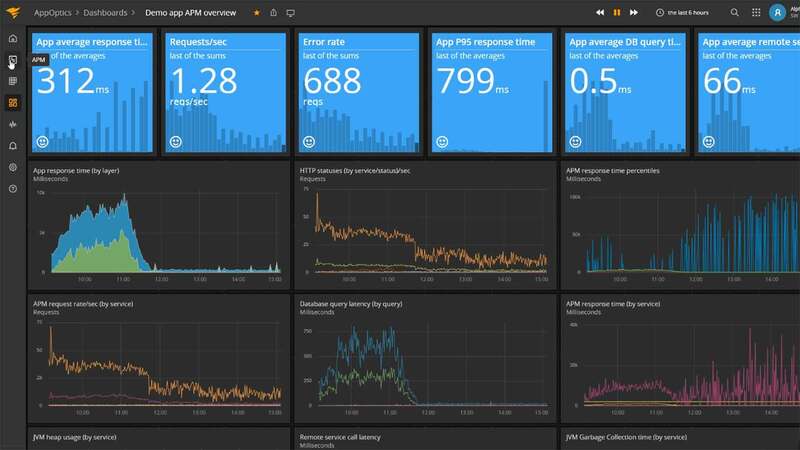 With AppOptics® Application performance monitoring, you can keep an eye on your entire application stack. Monitor your applications across many programming languages, including Java, Python, .Net and PHP. Get started quickly with auto-instrumentation. With distributed transaction tracing, trace requests through your complete infrastructure and easily visualize application bottlenecks. When you experience application latency issues, you can identify the cause in three easy steps. First, look at the average time the application takes to serve a Web request. Second, check out the transaction table's list of endpoints in the application, as well as their response time, volume, and error rate. This helps you identify the specific endpoint affecting your application. Detect your application problems faster and troubleshoot them more easily with SolarWinds® AppOptics.